Boy, this review was easy. Normally, when I sit down for a week or so with a gaming mouse, it's all about coming to grips with a new feel and a new design. 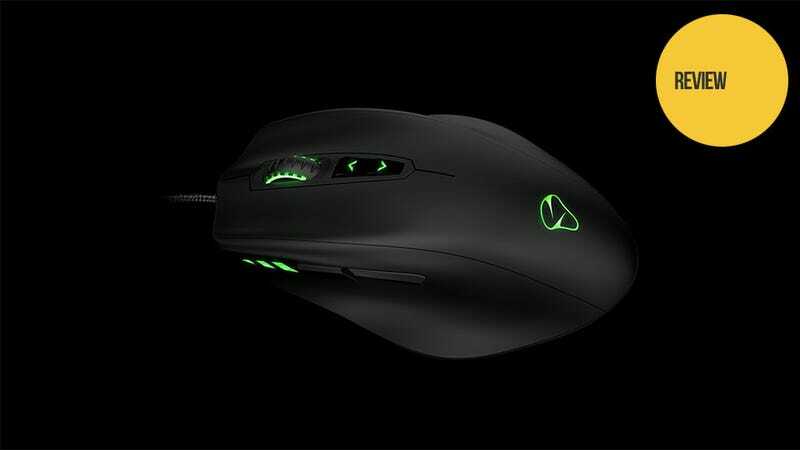 Not so with Mionix's Naos 8200, because it's the updated version of the Naos 5000, my personal mouse, the one that sits under my hand ten hours a day, five days a week, and which has done so for, oh, nearly three years now. There was zero familiarisation needed because, externally, the mice are identical. It's like Mionix is trying to replace a comfortable old pair of shoes with a new pair exactly the same size and exactly the same style. While this made the review easier, it also made it tougher on the new Naos 8200, because those are some big shoes to fill. - Surface Quality Analyzer Tool, which "measures tracking quality of your gaming surface"
Design - This is, by a country mile, the most comfortable mouse I have ever held. Which probably explains why Mionix haven't changed the design from the Naos 5000. It's got support for all five fingers, and even after a full day's use (8-10 hours), you hand feels fine. Feel - That design is complemented by a wonderfully soft matte finish, which while showing stains a little too easily, adds to the comfort factor during long sessions. Mionix says this is thanks to four layers of rubber being stuck on top of each other. What You Need, Where You Need It - There aren't many buttons on the 8000, or fancy wheels, or dials, or anything like that. Just a few buttons that work really well and feel indestructible. I also like how the DPI switch is clearly marked and sits right under the clickwheel, so you can change on the fly without having to flip your mouse over or pull off a button combo. Speed - Look, like HDTVs, we're at a point with this whole DPI arms race where the average human arm/eye can't seriously tell the difference. What I can tell you, though, is that this mouse is very fast and very responsive, enough to notice it when you've got the 5000 and 8200 plugged in side by side. Weight - Weird. The Naos 5000 let you add weights to the base to make it heavier (which I prefer). The 8200 does not. It's the best mouse I've ever used. Simple. It's incredibly well-made, it feels great, it's supremely comfortable and is snappy as hell. The loss of custom weights stings a little, but since I found performance a little sharper than on the 5000, I think the 8200 comes out on top. The Naos 8200 retails for $90, and is available now.